Whether you run a fully integrated corrugated plant, sheet feeder, or sheet plant, you can rely on knife-xpress as your primary resource for cutters, slitters and replacement blades. knife-xpress offers full line replacement knives and accessories for corrugated machinery. Our parts are manufactured to meet specific standards. They reflect an exact balance of metallurgical composition, tempering and geometry to ensure fast set-up, exact cutting and maximum run life. 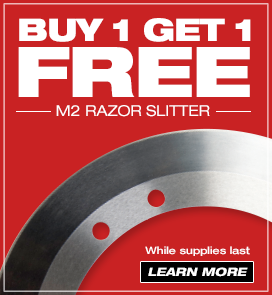 Our corrugated slitters will last longer and provide a better cut than competitive blades. We combine the best in material innovation, processes, coatings and heat treatment creating a razor slitter blade that lasts two weeks instead of one. You will get an extra week’s worth of cutting and run time. Double lifespan aligns perfectly with your scheduled maintenance. Our blades are built tough—to help you avoid midweek shutdowns. Better materials and heat treat processes make our cut-off knives last eight to twelve months under normal conditions. knife-xpress male slot knives have a patented serration unmatched by our competition. We carry carbide razor slitters, razor slitters, female slot knives, rotary shear blades, pull collars, brass strippers, corrugator fingers, score rings and creaser rings—all designed and machined to deliver precision and longevity in your production line. Clean cutting and minimal downtime mean everything in the corrugated industry. knife-xpress offers cost-effective and quick-turn solutions that provide optimal performance and help minimize downtime. Many of our products are in stock and available for immediate shipment. And with knife-xpress standard ground shipping on web orders over $1500 is free! When it comes to make or break cutting equipment for your corrugated operations, we make it easy for you. Wolverine™ is the newest male slot knife from knife-xpress, featuring newly engineered serrations designed specifically for over-recycled corrugate. Based on initial testing, the patent-pending Wolverine™ cuts better than any other male slot knife on the planet! This new serration greatly reduces the dust created by box cutting. The sharper angle of the serration produces a cleaner cut and features twice as many teeth as past serration. The best part about Wolverine™ is this upgraded serration is at no additional cost to you! All serrated male slot knives will now feature Wolverine™!